Investors may still be holding their breath, but larger mining companies aren't waiting around for the price of uranium to go up. No, indeed, they are buying smaller companies on the cheap. In this exclusive interview with The Energy Report, Equity Research Analyst Rob Chang of Versant Partners makes his case for deep value and discusses his favorite plays. With or without Germany and Japan, life goes on for uranium producers. Companies Mentioned: AREVA - BHP Billiton Ltd. - Cameco Corp. - Denison Mines Corp. - Energy Fuels Inc. - Extract Resources Ltd. - Fission Energy Corp. - Kivalliq Energy Corp. - Pitchstone Exploration Ltd. - Rio Tinto - U3O8 Corp. - Uranerz Energy Corp. - Uranium One Inc. The Energy Report: Fourteen months after the fact, the biggest story in uranium is still the tsunami that struck Japan and destroyed four nuclear reactors at the Fukushima Daiichi nuclear power station. Japan is attempting to eradicate its dependency on nuclear energy. Are any plants still operating? Will all reactors be shut down in the near future? Rob Chang: My numbers indicate that there are 50 reactors in Japan in total with only one still operating, and that last one is scheduled for a regular maintenance shutdown in early May. Since the Fukushima disaster occurred, every reactor that has been turned off for routine maintenance has not been permitted to restart. By mid-May, Japan will no longer run on nuclear power at all. TER: There is a huge rise in carbon emissions in Japan, where fuel oil consumption for power production has doubled. Are drastically increased emissions likely to affect policy decisions in Japan, Germany or elsewhere? RC: The carbon emissions are certainly growing. For Japan and Germany, an incredible rise is expected. There was an estimate that over the next few years, the increase in CO2 for Germany alone will be between 170–400 million tons (Mt) of additional CO2, which completely contradicts the country's previous goals. The populations and governments of these two countries are currently putting carbon emission concerns behind their fears of nuclear power. Germany is aggressively following its anti-nuclear power path while moving toward renewables and using other sources of power, such as natural gas, which unfortunately does generate a lot of CO2. Whether the country decides to go back to its original commitment of reducing CO2 emissions or to stay the path of avoiding nuclear at all costs will certainly be an issue, considering that alternative energy sources can't yet meet their energy demands. TER: It sounds like there could be some very interesting alternative plays emerging from Germany and Japan's planned energy shifts, as both countries have large economic bases. RC: That's the goal for both countries, to move toward alternative energy, which includes solar, wind power, hydro and geothermal. The problem with that is none of these can really provide a consistent form of baseload power. With solar, if you get a sustained period of darkness, you're going to have problems. You could also have a lack of wind, or a lack of suitable locations to build dams to generate hydro-electric power. As for geothermal, Japan has some capacity, but studies show that it's not enough to fully replace nuclear. TER: What are the predominant, global sources of baseload energy? RC: Baseload sources of power, those that are available at all times, include natural gas, coal and nuclear. Of the three, only one is zero-carbon emitting after being built, and that would be nuclear power. That's the big argument in favor of nuclear power. It is pretty much the only source of baseload power that solves all of the problems in terms of carbon emissions, low-cost power production and being relatively safe outside of the potential of nuclear meltdowns. Even when we look at Fukushima, it's really more about fear than reality. Nuclear power is still quite safe. TER: Rob, you said nuclear is low-cost compared to other forms of energy. Tell me more. RC: The costs of operating a nuclear power plant after it's already been built are probably the lowest among all energy sources. If you look at it in terms of alternative energy, which are heavily government-subsidized forms of power, it's actually very expensive to run those projects. On top of that, you still have the additional not-in-my-backyard problems for wind farms, which many people dislike. Although alternative forms of energy sound like a great option, nuclear power makes a lot more sense. TER: Looking at a chart, uranium seems to have some support at about $50/pound (lb), and it seems to be in a trading range now with resistance at around $55/lb. That looks like a consolidation pattern to me. RC: I'm more of a fundamentals analyst than a technical analyst, but I do observe the same patterns that you're seeing. It seems like it's trading in that range primarily because of near-term supply and demand fundamentals. Two, three or five years from now, if mine production schedules go the way they're supposed to, we should be in balance, with maybe even a slight surplus. TER: Where is new supply coming from? RC: The three primary mines that are coming online that are expected to meet upcoming demand are Cigar Lake in the Athabasca, run by Cameco Corp. (CCO:TSX; CCJ:NYSE), the expansion of Olympic Dam by BHP Billiton Ltd. (BHP:NYSE; BHPLF:OTCPK) in Australia and the Imouraren mine that's run by AREVA (AREVA:EPA) in Niger. Together, these make up the bulk of the upcoming supply that's theoretically supposed to balance the increase in demand. That's assuming the World Nuclear Association's best-case scenario, as presented last year, unfolds. Demand may be lower or higher, but it does take into account the shutdowns in Japan and Germany. TER: Does this consolidation pattern have anything to do with the acquisitions we've been seeing in the industry? RC: I can't really say it is definitely a consolidation pattern. But when you are seeing consolidation in the industry, you generally see it in the low parts of the market when larger firms can see value in other firms and believe that their prices are going to go up and markets are going to be better. They might as well buy now when it's cheap and get bigger. We are certainly seeing that now, and we have been seeing that for the last two years. In my opinion, we're going to see more of it going forward. We've seen some pretty nice ones—the Chinese buying Extract Resources Ltd. (EXT:TSX; EXT:ASX), Fission Energy Corp. (FIS:TSX.V; FSSIF:OTCQX) getting Pitchstone Exploration Ltd. (PXP:TSX.V) and now Energy Fuels Inc. (EFR:TSX) acquiring the U.S. assets of Denison Mines Corp. (DML:TSX; DNN:NYSE.A). These represent a lot of very positive signs for the industry because usually when you see consolidation, it signals the bottom in most industries. It looks as though we may be seeing that as well here. TER: What about uranium price? Will it remain weak, as it is now at $50–55/lb.? RC: It could, unless we have a catalyst. Right now, it seems like a very comfortable range for uranium. The main catalysts that many are waiting for is Japan's possible decision to restart its nuclear reactors. Once that happens, I would bet that we would see a run-up in the spot price. How far up it goes will be tough to say. It will entirely depend on how aggressive the nuclear roll-out or re-ignition occurs in Japan. For most of us, we believe that it's not a matter of if, but when the reactors are restarted. The government has already decided that it needs to. It's more a matter of getting the locals and the mayors in the areas to sign off on it. But once that happens, we should see the price go up. TER: What is your price forecast? RC: I believe uranium prices will rise a little bit, from here at least. For 2012, we're expecting an average price of $55/lb. 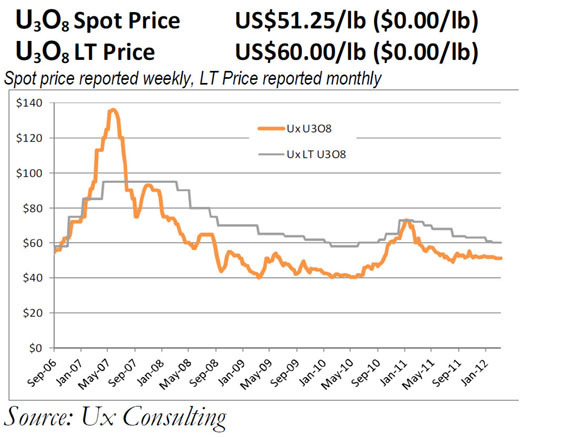 TER: If it rose above $55/lb, would that create a secular bull trend in uranium equities? RC: I believe so. The uranium equities have been moving higher over the last six to eight months, primarily based on the fundamentals despite the fact that the uranium price hasn't moved. I fully recognize that they've come off highs from January and February, but overall they're still up relative to the Fukushima event. I believe that as the uranium spot price moves higher, there will certainly be more interest in the uranium equities. TER: What names are you recommending to investors? RC: The three names that we cover are Energy Fuels, Fission Energy and Kivalliq Energy Corp. (KIV:TSX.V). We still are very bullish on all three. TER: Ok, let's take Energy Fuels first. RC: As you know, Energy Fuels acquired the U.S. assets of Denison Mines, but Denison has been getting most of the publicity because it is basically cleaning itself up to be acquired by Rio Tinto (RIO:NYSE; RIO:ASX) for its Athabasca assets. However, people should be recognizing Energy Fuels as a big winner given that it has established itself as the premier producer in the U.S. That's pretty significant, because the U.S. is the largest consumer of uranium. The U.S. consumes over 50 million pounds (50 Mlb), but it only produces 4 Mlb/year. So there's a massive shortfall between U.S. demand and supply. Security of supply is always going to be important for power generation. Another thing is that Energy Fuels acquired the White Mesa mill from Denison, which allows it to put its Energy Queen and Whirlwind mines into production. Those are two turn-key mines that could be turned on within a year of the production decision. Those two mines are basically on pause while Energy Fuels clears all of the permitting and rebuilding hurdles for the Piñon Ridge mill, but now that it has acquired the White Mesa mill, it no longer needs to wait for Piñon Ridge. It can just go and process everything through there. So, unlocking those two mines will allow it to produce over 1 Mlb/year in the U.S. and provide immediate upside. There aren't that many producers out there, and Energy Fuels is a new producer on the block. I can see the company commanding a premium once the dust settles. TER: Your target price on Energy Fuels is $1.10, which is an implied 300% return from here. Do you believe that startup of these two turn-key mines is going to be the catalyst for that kind of move? RC: It's one of many catalysts. It's a near-term producer now, so that is also factoring the net asset value (NAV) of the production coming from those mines. It factors in all revenue streams coming into the company. The reason why, in my opinion, Energy Fuels has been trading this low is that uranium has been out of favor and Energy Fuels has been viewed previously as a developer that was not producing and still needed a permit. These hurdles have been addressed, improved upon or eliminated. I think once people give Energy Fuels a good hard look, they will realize it's significantly undervalued. The overall market has been pretty negative, so investors are pretty reluctant to deploy capital. And they generally prefer producing companies that are large and subsequently safer. Energy Fuels has historically been a developer, but will be a producer after the deal closes. For this combination of reasons, it is not moving up as much as it should be. I believe that this is temporary and when sanity returns to the market, Energy Fuels will rise. RC: Kivalliq has the highest grades of any uranium company outside of the Athabasca Basin, 0.69% U3O8. The global median for U3O8 grades is 0.07%. So at 0.69%, Kivalliq is actually one decimal spot to the left of the global median. Kivalliq is located in Nunavut, which does present some challenges given there is little infrastructure in the area. However, the company already has 27 Mlb of this high-grade uranium near the surface. It has the potential of getting a lot more. There is the possibility that it could grow this to a +100 Mlb resource with the proper time and drilling. This makes Kivalliq a very interesting company. Another reason to like this company is that to the northeast of it, AREVA is developing the Kiggavik uranium deposit, which is a +100 Mlb uranium deposit. AREVA is way ahead of Kivalliq in terms of exploration/development, and there may be some synergies involved there in terms of Kivalliq being able to use AREVA's infrastructure builds. So I'm very positive on Kivalliq. TER: Kivalliq has been weak for the past month. Does that make it even more interesting to you? Do you see it as a deep value currently? RC: Absolutely. I have $1.10 target price for Kivalliq as well. That's about 150% of upside from here. So I believe there is lots of upside. TER: Your third pick was Fission. RC: I really like Fission Energy. This is in the Athabasca Basin, located right next door to Hathor Exploration, which is now Rio Tinto's Roughrider deposit. In fact, the western extension of the Roughrider deposit actually goes over the border into Fission's territory. If Rio Tinto was to ever develop this, it would make a lot of sense to develop that little nub that goes over the border. There's no reason for Rio Tinto to stop right at the property line. A few meters to the west of that is Fission Energy's J Zone deposit, which has an initial NI 43-101-compliant resource of 9 Mlb that it announced earlier this year. It would make a lot of sense for anyone, like Rio Tinto, wanting to consolidate the region, to buy Fission Energy next door as well as Denison's and AREVA's assets. Within a 5 kilometer (km) area, there is already more than 110 Mlb of uranium. So it would make a lot of sense for one company just to consolidate the whole region. TER: An acquisition certainly does not look to be baked into Fission's stock price. RC: It was previously. Fission traded over $1 at one point in November, when Hathor was being acquired. It's the classic situation where investors buy on the potential and when it doesn't happen immediately, they give up and sell. It is further exacerbated by the fact that we have a negative market in general. Even though you've seen Fission drift lower, the story hasn't fundamentally changed. If anything, it is closer to actually happening now than it was right after Rio Tinto bought Hathor. I haven't seen many scenarios where an acquiring company buys Company A and immediately turns around and buys Company B. They generally take some time in between to digest the acquisition or do more work. So, if anything, now would probably be a better time to buy Fission. Another reason Fission has drifted down is that many expect Rio Tinto to acquire Denison first given that it's larger, and then turn its attention to Fission last, or after AREVA. So maybe it's more of a timing issue and people would get back into Fission when they see more activity in the basin and because they could see a bid for Denison. TER: What are some other names you like? RC: Uranerz Energy Corp. (URZ:TSX; URZ:NYSE.A) is a near-term producer. It is scheduled to produce by the end of this year, which would make it the next uranium producer in the world. It is located in the Powder River Basin in Wyoming. It has pretty high grades as far as in situ recovery (ISR) mining goes. It's an ISR miner, which means it uses injection wells and pumps the solution out of the ground. It is a low-cost operation similar to that of Uranium One Inc. (UUU:TSX) in Kazakhstan and some of the assets that Cameco has in the U.S. Uranerz is also run by one of the best management teams that I've come across in the uranium space. Given that it's a near-term producer, I am very positive on Uranerz for the same reason I feel that Energy Fuels is a bigger deal than what the market is giving it credit for. Another name that I've very positive on is U3O8 Corp. (UWE:TSX.V). It is basically a South American consolidator of uranium assets, with assets in Colombia, Argentina and Guyana. I had the opportunity to visit all three. The flagship property is in Colombia, where it has decent grades. It looks like it there will be a suite of metals that the company can extract. In fact, it believes it can economically extract other metals such as molybdenum, vanadium, some rare earths and phosphate. Its asset in Guyana could be another Athabasca Basin. TER: Many thanks to you, Rob. RC: I've enjoyed it. Thank you for having me back. Versant Partners Analyst Rob Chang has extensive financial markets experience dating back to 1995. He helped run a multistrategy hedge fund, worked in base metals research at BMO Capital Markets, managed resource funds at a boutique investment management firm and was a global mining equity analyst at an independent investment bank. 2) The following companies mentioned in the interview are sponsors of The Energy Report: Fission Energy Corp., Uranerz Energy Corp. and Energy Fuels Inc.. Streetwise Reports does not accept stock in exchange for services. 3) Rob Chang: I personally and/or my family own shares of the following companies mentioned in this interview: From time to time, Streetwise Reports LLC and its directors, officers, employees or members of their families, as well as persons interviewed for articles on the site, may have a long or short position in securities mentioned and may make purchases and/or sales of those securities in the open market or otherwise.